James Bourne was born on 8 Feb 1781 at Ford Hayes, Bucknall, Staffordshire. James became a Methodist in 1799 – in the same year as brother Hugh, and joined the society at Ridgeway, some 3 miles from Tunstall. 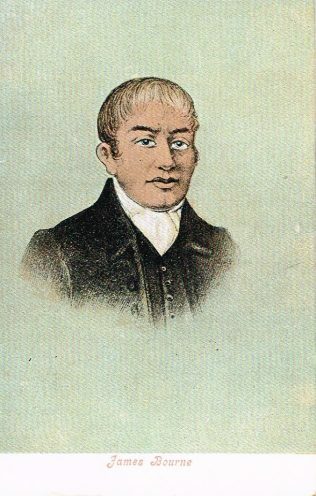 James supported his brother in the organisation of the Camp meetings at Mow Hill, in particular, continuing to support following the decision of the Methodist Conference to ban such meetings in 1807. Kendall describes his character as ‘calm, self-possessed, practical, ever ready to do his best without fee or reward’. 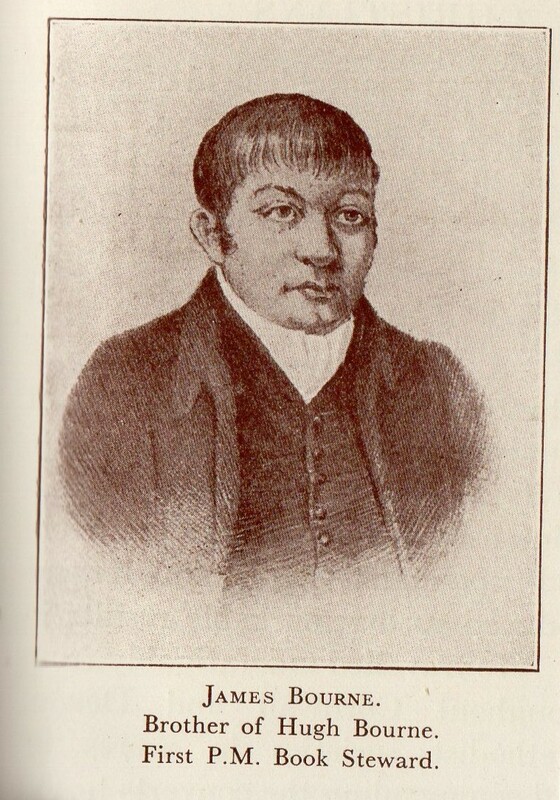 James was a diligent and active preacher, travelling many miles when required. In 1808 he preached in the open air at Tean, some 20 miles from his home at Bemersley, and was instrumental in the forming of a Society there. In 1809 supported his brother in appointing James Crawfoot as the first travelling preacher. In 1810 James took charge of a new class at Standley, which was formed as a separate society that could not be incorporated satisfactorily into the existing Burslem Circuit. James was a key influence in the formation of the new connexion in 1811/12, in particular in the building of the first church at Tunstall and taking the role of Local Preacher in the first PM circuit. Along with his brother Hugh, James attended the meeting in Nottingham in 1819 which was the precursor for the first national conference and laid down the general rules for management of the new connexion. James was appointed as minister to the Tunstall Circuit. James was President of Conference 1826, 1829, and 1842. He was held in good regard for the way he conducted business meetings. In the 1851 census, James is recorded as a farmer of 97 acres employing 3 labourers. He was living at Bemesley with his wife Sarah and son John. James was something of a business entrepreneur developing several businesses which helped to provide financial support to the PM movement. These included pottery ventures with James Nixon producing PM commemorative plates. In later life James suffered a number of business reverses and thereafter played no active part in the affairs of the connexion. He received a small annuity from connexional funds as a testimony of the gratitude and respect felt for his former services.